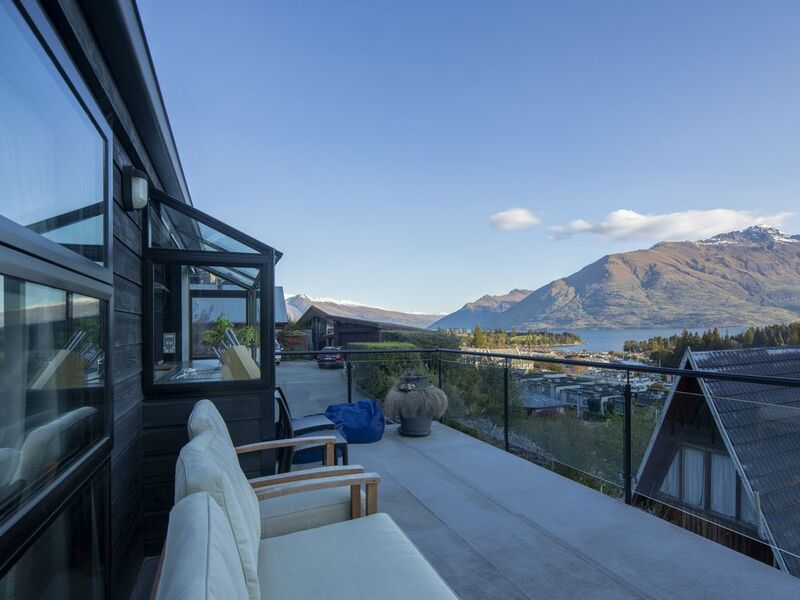 Located right in the heart of Queenstown overlooking Lake Wakatipu, Lakeview is surrounded by the areas best thrills, views and restaurants. Or if you are looking to stay in and entertain, the house will meet your every need with a front deck, spa pool, and private courtyard. This large 5-bedroom, 4-bathroom home offers the perfect area for outdoor entertaining complete with a spa, outdoor furniture, and superb views. The large lounge offers the ideal spot for guests to unwind with friends or to catch up on some TV, but if you are looking to go out, the Centre of town is 5 minutes’ walk away. Please also view our other listing ' Country Estate Queenstown' sleeps 12 people. NB: Dwelling contains a private independent self-contained studio that can also be secured with this home. - Credit card details are required at check-in for a security deposit of NZ$1,000. Any guest who confirms a reservation will be responsible for damages not limited to NZ$1,000. Authorisation of NZ$1,000 will be held on card prior to booking. No charges will be made unless we make a claim within 14 days after check out. No Stag parties, no parties. No extra guests at house unless prior approved by the property owner. Costs incurred to remove excess rubbish left on site will be charged to guests. Typical check in time 4 pm unless pre-arranged in advance. Large home and Spa Pool. We had an amazing time, and the locatin was perfect fro getting into town easily. Beds and living areas suited our needs perfectly. Had a great time and thoroughly recommend the property. Perfect location and size for our holiday. The house was warm and spacious with every thing we needed. The property was fantastic and the location perfect. The property was fantastic and the location perfect. The only negative was that one of the heat pumps does not work. It was very cold and we had to buy a couple of fan heaters to keep us warm. Location is absolutely stunning, glass windows looking out onto the most stunning view. Location is absolutely stunning, glass windows looking out onto the most stunning view. The house itself has been refurbished, new carpet, painted etc. It is a great property for a group of people or a couple of families. Lots of different areas to escape to - verandah, out the back, lounges, dining/kitchen areas etc. The hills were steep but thats no secret, that is simply queenstown. A cab back up the hill was about $7.60 so all good! Fantastic views from this property from master, bedroom, dining, kitchen, living, lounge and deck. Fantastic views from this property from master, bedroom, dining, kitchen, living, lounge and deck. Situated up a couple of steep street climbs when on foot so not for the couch potatoe but we enjoyed the exercise. House was very clean and cleaner very happy for us to leave our bags before check in and after check out. Spa was good. In general we loved the place!